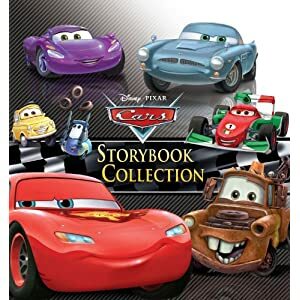 The story: This collection of stories features the gang from Radiator Springs. Lightning McQueen races against new competitors, the cars become honorary deputies, and Guido is surprised by an Italian extravaganza! Mama opines: The first few stories re-tell the plot of the movie, but most of them are new. David adores this book. This is the one he picks to bring with him in the car or look at while he is eating a snack. This actually was a library book. David was so excited to read it that he took it to the grocery store with him and it got snagged in the shopping cart. When we took the book back to the library and offered to pay for the repairs, they gave it to him to keep because he loved it so much and it was such a worn-out copy. He thinks it's the greatest thing ever that he gets to keep a library book! 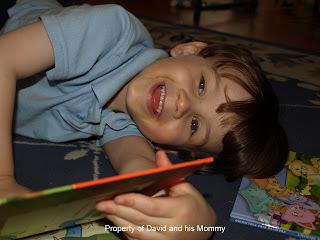 Thoughts from David:I like the book because the characters can really move. They can race with Chick and Stinger and because Stanley was the first to move into the area, he decided to name the town Radiator Springs. Favorite part: I like when they surprise Guido! What book does your little one ask you to read again and again?